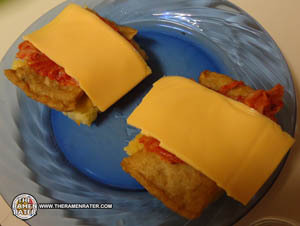 With the recent popularity of the ‘ramen burger,’ I felt it necessary to try them out, but with a twist. South Korean ramyun is easily available by many brand and the noodles are thicker as well as more plentiful than other country’s varieties. Let’s give this a try! 1 block South Korean style ramyun noodles – any brand (Nongshim, Ottogi, Paldo, Samyang all would be perfect for this. 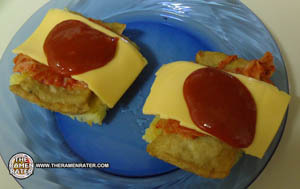 I used Ottogi Ramyonsari as it doesn’t have a seasoning packet included). 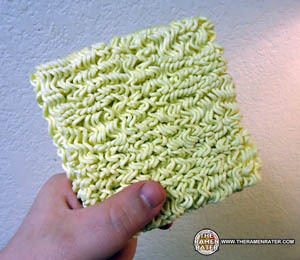 Make sure you’ve got a block of ramyun – it’s pretty simple to do: if the noodles are wider than most instant noodles you’ve seen before, they’re probably ramyun (especially if they’re a product of South Korea – or in Nongshim’s case, Rancho Cucamonga, California). 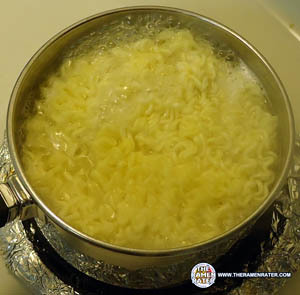 Drop the noodles in a pot of boiling water for about 4 minutes. You won’t need the seasoning packets. Drain the noodles really well. Return the noodles to the pot you cooked them in and crack an egg over them. Stir until the egg is full combined with the noodles. 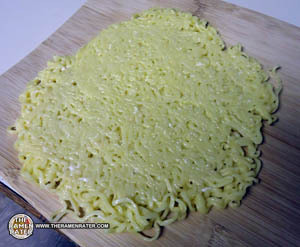 Put the noodle/egg mixture on a dinner plate and flatten a little – spreading them out a little. Now take the other plate and press it down on the mixture firmly. Put this in the fridge for two hours. 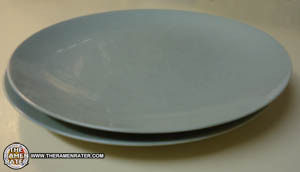 After the two hours, pull the plates out. Take the top plate off carefully. 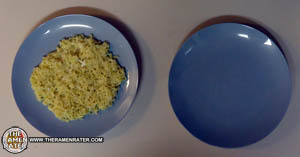 Use a spatula to loosen the noodles from the lower plate and drop them on a cutting board. 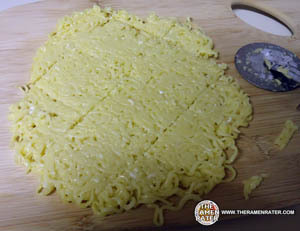 Use a pizza wheel to cut the noodles into squares. You could also use a cookie cutter to cuts them into circles or other shapes should you desire. 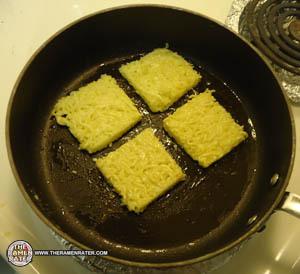 Put some oil in a skillet, heat, and start frying up the squares. I did it over medium heat and it took a few minutes per side to get them nice and golden. 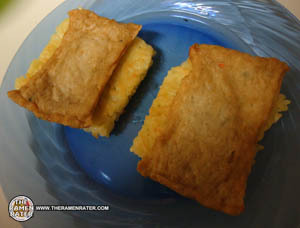 After they’re done, let cool for a minute on some paper towels (this will sop up any extra oil). Let’s make these bad boys! First layer I did was the Busan fish cake. I cooked mine in the microwave. 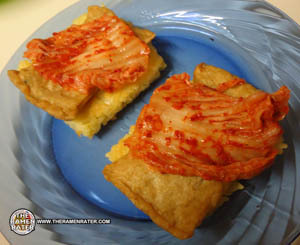 Then a couple pieces of kimchi. 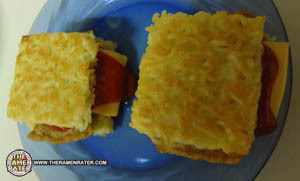 I really like cheese in my ramyun, so I thought why not try it on these? A nice bit of gochujang. Put the other half of the ‘bun’ on and you’re finished! Finished (click to enlarge image). The ramyun buns came out really nice. They have a great crispness and wonderful textures to them. It’s kind of like a handheld spicy ramyun noodle bowl! If you decide to try this, let me know – send pictures and I’ll post them here! Eager to see your creations!